Well here we are again. As I described in my first document of learning one year ago, everything in life recurs, it comes back to us, happens again. So here is the recurrence of my TALONS Social Studies processes and learning. Now I can utilize that plural version of the word ‘synthesis’. In my leadoff post last year in, what was, Social Studies 10, I started off by explaining what synthesis meant, and why I had chosen it as the title for my first blog post, along with the word ‘circle’. The main description I gave to the former word is that it is the culmination of many parts and what you could call building blocks to create a whole. In this case I am taking pieces of the world, pieces of skills, and pieces of learning, and bringing them together to create who I am. So, of course, I will be continuing that journey this year. I added the word ‘circle’ because, as I previously mentioned, it all happens again and we go through those same synthesizing process multiple times in our different journeys. In that first post, just to remind all of you, we were meant to discuss the questions that were brought up in class, “Where are we going?” and “Where have we been?” As I explained then, “There is an infinite number of ways to answer the questions…” however, I have a slightly better idea how to do so now, now that I’ve seen a bit of my future that is. I’ve seen what TALONS Social Studies looks like, I’ve seen more of what my life looks like, and I’ve seen more of what the world looks like. I made my way through “Social Studies 10” developing a better understanding of what is important to me in this world. One of the ways that helped me significantly in this process was the roleplay of Laura Secord in the Canadian Confederation studies, as well as the fictional character I created for my final presentation, John O’Callaghan. I used these characters to help myself see other perspectives in historical events and it gave me a lot of insight into what they would have felt, as well as what I would have felt in those situations. This is something that I would like to do more of this year, possibly with the French Revolution, which I am very interested in learning about. I’m also excited for other major events in history like the American Revolution and the Industrial Revolution. These are all parts of history that I don’t know much about so I would love to delve deeper into some of the backstories of these and the impacts they had on the world. A key message that I finished off the year with in my Final presentation, was to appreciate what you have and not to get too hung up on the past. I think this is important as I move forward, just keeping my eyes up and on the world around me as it is so special. Additionally, this is going to be my last official TALONS semester, so there’s some reason right there for enjoying the present. I would also like to take this into my learning this year, if at all possible, and try to look at not only how we changed from negative events in the past, but also how we developed from some positive ones. I completely agree that we must see how we got here, the good, the bad, AND the ugly, but I find that we do often sway more towards the latter portion of that phrase in our modern world, and possibly past, but I think it’s crucial that we appreciate the good too. It will also help us find light in times of trouble today in current issues and problems. Much of this, was thoroughly achieved or closely attempted this week in our classes, for example. 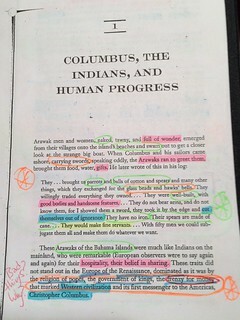 I spent a lot of time annotating the reading on Columbus that was assigned, from which I gained a lot of new ideas on various different topics, not just Columbus specifically or how the world’s view of history in general is sometimes tinted a certain shade. 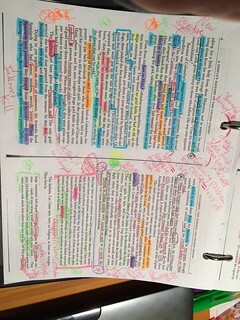 Here you can see some of my highlightings and notes in the margins of key ideas I found throughout the reading. I hope to continue this with all readings this semester. 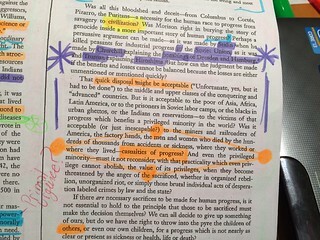 I hope to devote more time to these readings as well as other elements of the Philosophy Pop Quiz this year as those are all things that I am passionate about and enjoy doing and they will also benefit my learning in Social Studies and in general as well. I also gained a lot of new viewpoints through our discussions as a class and with Mr. Jackson. 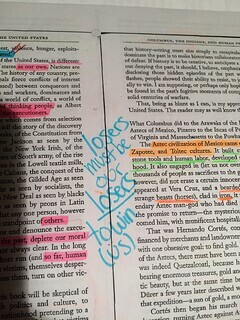 I think it will be very useful this semester to hear the unique perspectives of my classmates on some of the key events in the history that we will be studying, as well as on the topic of some current events, *wink *cough *the United States Election*. Another core competency that I would like to focus on is “Asses how prevailing conditions and actions of individuals and groups affect events, decisions, and developments (cause and consequence).” This is something that I hope to look at as we move forward more this semester in major events. An interesting point that arose in our final discussion this week was the concept of “young” and “old” civilizations. An example of “young” being The United States of America and an example of “old” being Germany. I found the different points of this concept interesting when looking at the reasoning behind these countries’ actions in history and in the modern world. It was very a very intriguing point to think about and made me wonder, if Europe is old, what happens when they get older? What happens when we get older, will they become our grandparents? And then the inevitable, or is it, can a civilization die? How will we be affected by that? Does our civilization have emotions? Will we grieve? Overall I think this will shape up to be a very unique and unpredictable semester. I am sure I will learn endless new things about myself and about the world, and I don’t know exactly where it will take me, or us, but one thing is for certain, it will all come around again in the end.